Behind the Peaks of Otter Lodge is Abbott Lake, named for Stanley William Abbott, the Parkway’s first resident landscape architect and planner. The 24-acre lake features a one-mile loop trail, and is stocked with smallmouth bass, catfish, golden shiners, sunfish, and blue gill. Fishing is permitted with the appropriate license. The visitor center offers restrooms, water, and an amphitheater. It is open May through October. Postcards, books, and other items reflecting nature and local-interest themes are sold here, and the center features an exhibit on wildflowers, birds, and animals of the Blue Ridge. 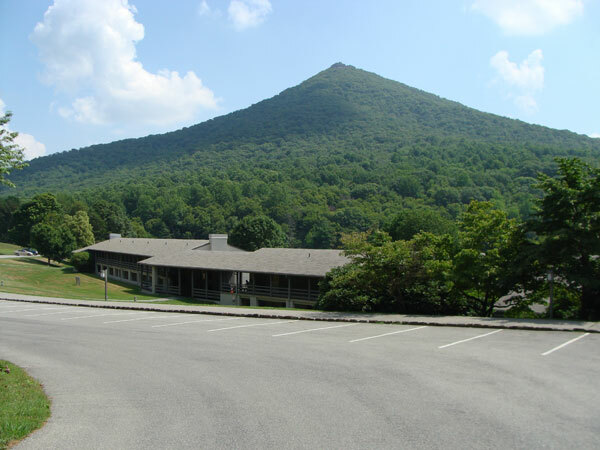 Bus rides to within 1,500 feet of the Sharp Top summit are available at a station not far from the visitor center. Sharp Top is historically significant as it marked the northern most boundary of the Cherokee Nation. This area includes a 62-table picnic area, camp store, and 141-site campground, which features 53 RV/Trailer sites. Visitors here gain a sense of both the history of community and the history of tourism in the Blue Ridge Mountains of Virginia. By the mid 1800s, there were twenty families integrated into the business of tourism, providing food and labor for a large resort hotel. Early tavern provided the basic necessities for travelers as early as 1840 and is preserved at the Peaks of Otter as well. Prominent historical figures have visited or written about the Peaks of Otter, signifying its importance as a natural landmark in Virginia’s Blue Ridge. Natural history also abounds at the Peaks of Otter, an area that is representative of the hardwood forests common along the mid range elevations of the Parkway. An extensive trail system offers visitors access to these areas. This area also boasts a campground, picnic area and concession-operated bus service up Sharp Top Mountain. Area hikes include: Sharp Top, Elk Run, Harkening Hill and Johnson Farm Trails. Historic buildings include: Johnson Farm and Polly Woods Ordinary. Camping is one way visitors traveling through the Blue Ridge Parkway can spend the night under the stars in one of America’s most beautiful natural settings. The Parkway’s nine campgrounds were built years ago and do not offer hookups, but most have at least some sites that will accommodate sizeable recreational vehicles, and all offer restrooms (showers are available at Mt. Pisgah campground only), drinking water, picnic tables and grills. These campgrounds are open from May – October with fees charged on a per night basis, which includes two adults over age 18. Children accompanied by an adult camp free. Reservations may be made for some sites in advance. To make a reservation, visit www.recreation.gov or call toll-free 877.444.6777. As a general rule, demand is higher on weekends and holidays. Group camping is available only at Linville Falls Campground. Call 828.765.6082 for more information. In addition, limited backcountry camping is available via permit at Basin Cove in Doughton Park 336.372.8568 and Rock Castle Gorge 540.745.9661. Camping outside of designated campgrounds (or without a permit at backcountry sites) is prohibited.